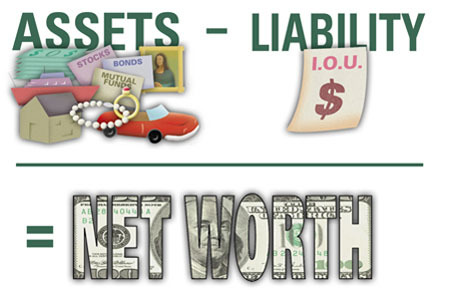 Why should you be calculating net worth for yourself? Posted on February 17, 2015 by Financial Underdog	in Uncategorized. Ever since I’ve decided to get better at personal finance, I’ve been calculating net worth for myself and later for two of us. Of course, during first couple of years it was mostly negative because I borrowed too much and had a tendency to spend every dollar I’ve made. Of course, now our net worth statements look much more positive (check out our net worth update from 2014). But I believe you should be calculating net worth even if you’re broke. You might say – heck, why should I? Net worth statements are for rich people who have money, stocks, and flying cars. Why should broke people bother with this? Reason #1: Calculating net worth showed where I am going financially. For example, my awesome negative net worth of $22,000 wasn’t something positive by itself. In fact, it was embarrassing. But if next month I saw a slight decrease of my liabilities (fancy word for “debts”) and increased cash, this would mean I’m moving in a positive direction and slowly but surely going towards being positive. And seeing progress is fantastic especially if you’re broke. Even if my net worth increased by lousy $500 towards being positive, it would give me a jolt of energy to keep working at it. Would I have the same energy if I didn’t know I was moving in the right direction? Doubt it. When I was just starting out, I was genuinely afraid to open my mail. I knew I owed money, and I knew it was a lot of money. But I was very sheepish to face it – hey, maybe if I ignore the bills they’ll go away. Heck no! They just kept coming. Shortly after, they started calling me and demanding payments. Only after I laid out all of my bills and all of my statement, I was ready to deal with them. 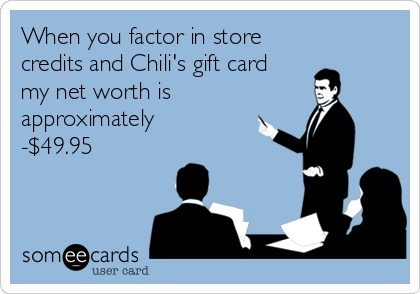 Only after I’ve calculated how much I owed vs. how much I actually have, I’ve understood the severity of the situation. And only then it became crystal clear to me that I need to do something about it. It was stupid of me to ignore my problems hoping they’ll just go away. Interestingly enough, my imagination painted a picture that was much worse than reality was. Yes, it was bad. But for some reason my imagination made it much worse. Only when I’ve calculated my first net worth statement showing how much I owe between all the accounts, it became clear to me the situation isn’t as bad as I felt. – Reach financial independence and only work because we want to, not because we have to. Let’s face it, all of these goals are achievable given enough money. But how would we know if we reached them or not without calculating net worth for ourselves? – Fair market value of your vehicles and other significant items such as coin collections, jewelery, etc. Step 3: Subtract debts from your assets. The resulting number is your net worth.